What are the goals for our lesson plan format? Do we use or want lesson plans so that we can be like the public schools? School administrators like them because they can read over what all their teachers are doing in a given week. This helps them manage their staff. Homeschoolers need some structure to their day. If they don’t have some kind of plan or schedule to their day, then everyone just wanders around and plays games and nothing gets accomplished. There IS a middle ground between having strict homeschool lesson plans and schedules and having no structure at all. After watching many families over the years, I have found that the ones that use lesson plans tend to burn out on homeschooling much quicker. Why is this? Probably because it takes a bit of time and effort for the mom to write out lesson plans. Some days it can be hard to follow those plans. 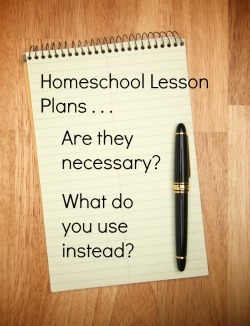 Homeschoolers can use a different lesson plan format and still have a basic structure to their day. They might choose to do table work in the morning and projects in the afternoons or whatever works best for their family. If their child is used to watching TV or playing video games in the afternoon it might take a few days of “no” for the child to get used to the idea that he will need to find some projects to entertain himself. At the beginning of the school year, sit down and set some goals, then break down those goals so you know what you want to accomplish for a month, week and day. A homeschool checklist sometimes works well for families because it gives them something to focus on and yet gives them a little bit of flexibility. Some people find that a checklist works well for them. They can list what they want to accomplish for the week and use that as a guide. A strict schedule of "9:00 Math, 10:00 Grammar" etc. can be burdensome to many families. If they are enjoying their time of learning and want to continue, sometimes a strict schedule forces them to move on while they are still enjoying learning. History - Start reading History of US. Read 2 chapters a day. Basically, you set a reasonable goal for each subject for the month or quarter and then break it down from there. The best way to work with your children is for them to work into a self-teaching model of homeschooling. They create their own quarterly goals and take responsibility for their own education. Any time you use a homeschool curriculum or lesson plan, make sure you always supplement the curriculum with field trips, nature walks, reading of picture books, using hands on projects, etc. Supplementing your curriculum increases your child’s retention of the material he is studying. If you are studying US presidents and then go visit the home of a former president that has a museum not too far from your home, that gives your children something to use to remember what a president is like and how they lived. Field trips help children put the pieces of life together in their brains. If you visit a farm where they grow carrots, and then another year you visit a vegetable processing plant and a grocery store, you can talk about the process of how our food is grown and how it gets to the store. If you do gardening and canning of garden produce, then your child will have an even better understanding of how our world operates and what it takes to put food on the table. When thinking about a lesson plan format, think in terms of goals and education plans instead. Don’t spend all Sunday afternoon making homeschool lesson plans for the next week. You will be exhausted with homeschooling by Thanksgiving. Instead, get your goals for the year at the beginning of the school year. Divide out how much you think you will need to do each week and month, and then evaluate what you need to accomplish with a more general picture at the beginning of each week. I want you to be refreshed in homeschooling and not burdened by being tied to a burdensome lesson plan format that both your and your children end up hating. Joanne Calderwood talks about being underwhelmed (as opposed to overwhelmed) in regard to homeschooling, meaning that there is a simpler way to approach homeschooling than what most people are using. 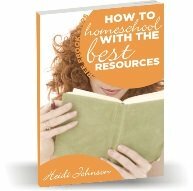 You can listen to what she has to say about simplifying your homeschool year by using her Self Teaching Manual.